Nobody who has Davidson's best interests at heart wants Mi-Connection to fail. Period. We should all be thankful that Mi-Connection just posted its best quarter ever in its creeping effort to get to self sufficiency. Also, we should all be eternally grateful to outgoing Mi-Connection Chairman John Venzon for the work he's done to get the company headed in the right direction. We said so here last year as he and his family departed for Kansas City and as he steps down as Chairman he leaves the company with breathing room. The story in this week's Lake Norman Citizen outlines what a truly awful situation he was handed by those who chose to buy the operation when he agreed to take on the challenge of fixing it. Hopefully, his contributions won't be lost to history as this story plays out. However, nobody should believe that being in the communications business is in the long-term interest of our town no matter what the current headlines say. Getting into the cable business was a bad decision that has cost our town dearly in lost opportunities. Money that could have been spent enhancing our town has instead gone to bailing out a business we never should have entered in the first place. That money and those lost opportunities are what once again make Mi-Connection the "Bad" part of Davidson's budget. Below is the current Mi-Connection situation and how it impacts Davidson's finances in next year's budget. These annual expenses drain coffers and prevent the town from doing important things like moving forward aggressively on a new fire station or building more greenways - things the town both needs and/or wants. They have caused the town to implement high solid waste fees for single family homes, and they have kept our tax rate artificially high. At the public hearing on May 13th, Commissioner Fuller made a very deliberate effort to point out that Davidson's tax rate is the 2nd lowest among the list of towns in the state that Davidson uses a benchmarks for various comparison. You read that correctly. Davidson does in fact have the 2nd lowest tax rate among this list of towns - 4th lowest if you also include Cornelius and Huntersville. One might question if all those towns are true benchmarks, but nonetheless, our rate is not too bad by comparison. But only looking at it that way is like putting lipstick on a pig. A town's tax rate is driven by a number of factors including the size of the tax base, commercial percentage of tax base, population, and the services provided under the property tax. Smaller towns with lower tax bases need higher rates to bring in enough revenue for the bare minimum of services. On the "services provided" side of the equation, many of Davidson's benchmark towns do not have a solid waste fee at all or the fee is much lower than Davidson's $201 for single family homes. They pay for solid waste pick up out of property taxes. The rate might be higher, but the overall cost to live in the town might be lower. Only looking at the rate is not an apples to apples comparison. Unfortunately, the town currently does not have the data broken down in a way that provides that view. However, there is one thing for sure if we're only looking at the property taxes. Mi-Connection costs Davidson about 7.75 cents on our tax rate. Without the "Mi-Connection tax", Davidson would have the lowest rate among our benchmark towns and even be lower than Huntersville - a town with over 4 times our population. Only Cornelius would be lower locally. This would all be true even with the town keeping the huge "tax hike" after the last revaluation when the rate was not lowered to revenue neutral as it should have been. Think about what that could mean for economic development. Think about what the story could be if one could showcase all our town has to offer and be able to say we have a truly low tax rate. There may still be issues with the total cost of living in the town, but from a business's point of view the lower property tax rate would stand out. With that in mind our Board needs to keep its eye on the ball and take the steps necessary to prepare for an exit from Mi-Connection. As things get "better" for Mi-Connection in the short-term, the temptation will be to think maybe being in the cable business isn't such a bad idea. That's not a mistake we should make twice. Davidson Commissioners are getting ready to vote on the proposed next town budget in a few weeks - possibly by June 10th. With that in mind it's time to commence the annual budget review we do here at aShortChronicle. This year there is plenty of material to work with, so rather than a single post it will be a series called "The Good", "The Bad", "The Downright Ugly". Let's jump right in with "The Good", and I do truly believe there are some nuggets of goodness in this budget. There are actions taken that show solid decision making and a movement towards prioritizing spending towards the true responsibilities of government and away from things that frankly government should not be doing. It's safe to say some of this is the result of the new blood on the Board after last fall's elections. That's a good sign for the future. In this previous post we mentioned that the Board was discussing possible increases to the solid waste fees for single family homes to implement weekly recycling and re-instituting fall leaf pickup. This really needed to be a data driven decision, and it appears that's what has happened. After receiving the results of the latest citizen survey, there was little support for increasing these fees, and they have been dropped from the discussions. Moreover, on the recycling side it has since become known that any house wanting an extra recycle bin can actually pay for it directly with the town's solid waste company. That's the right way to handle this for the very, very small number of homes that may actually need it. As an added bonus, solid waste fees will actually be dropping for the town's multi-family units to $60 per year. On the public safety side Davidson's fire department will now be fully funded to have 4 fire fighter/EMTs on call 24/7. That brings the town's fire protection service up to standard and allows for 2-in/2-out activity on fire calls which increases safety for our first responders. In the past this was not the case at least some of the time. 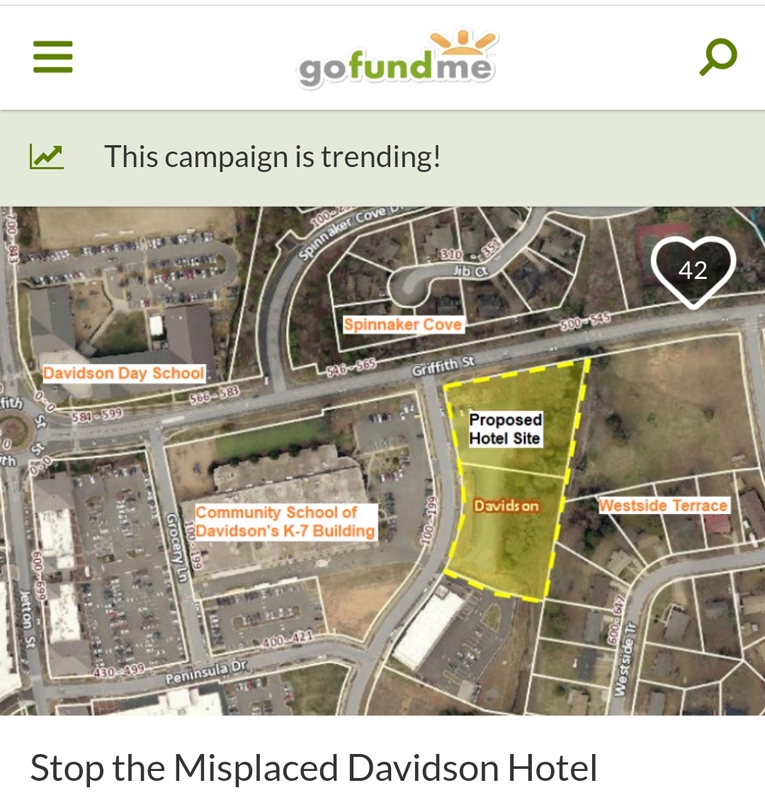 Davidson's new Board deserves credit for increasing funding to allow this. The increased cost was about $75,000, but that's money very well spent. As another example of good prioritization, the Town has also confirmed that new local dollars won't be going to the Davidson Design for Life program once the current grant funding runs out. Per town Finance Director Cindy Jones, "DD4L is funded through the project fund, not the general fund. There are no funds budgeted in the general fund for DD4L program or health impact assessment work." And that's a good thing. currently this funding comes from a grant from the CDC, and if it continues funding needs to come from outside of the town. The HIA work provides little to no value for the average Davidson resident. It is primarily an academic exercise. Funding this out of the general fund would be a waste of town resources. (See this previous post on one of the town's HIAs with comments from Davidson College Graduate and former State Senator Dan Clodfelter. Mr Clodfelter is now Charlotte's new mayor). Finally, with this budget the Board has begun scaling back direct financial support for local non-profits. The budgeted amount is being decreased from $50,000 to $35,500 with direct support decreasing for Ada Jenkins. According to this article in the Huntersville Herald, the recommendation came from Town Manager, Leamon Brice. The apparent support of this reduction by Commissioner Cashion who also has experience on the finance board of Ada Jenkins should keep the hounds at bay who would usually decry any decrease to non-profits. To be clear, the Town still provides a large amount of support to local non-profits in various ways. However, this decrease should be a model for the Town getting out of direct funding for things that should be handled by private donations - donations like this one to Ada Jenkins from the local Rotary Club. That's the good news in this year's budget. Next up "The Bad". Update: It appears after further discussion, at least some of the direct cash for Ada Jenkins Center is back in the budget. It's tough to cut no matter how much you try. The budgeted amount it now back up to $50,000 per the Town's finance office. Dollars and disillusionment in our elections. 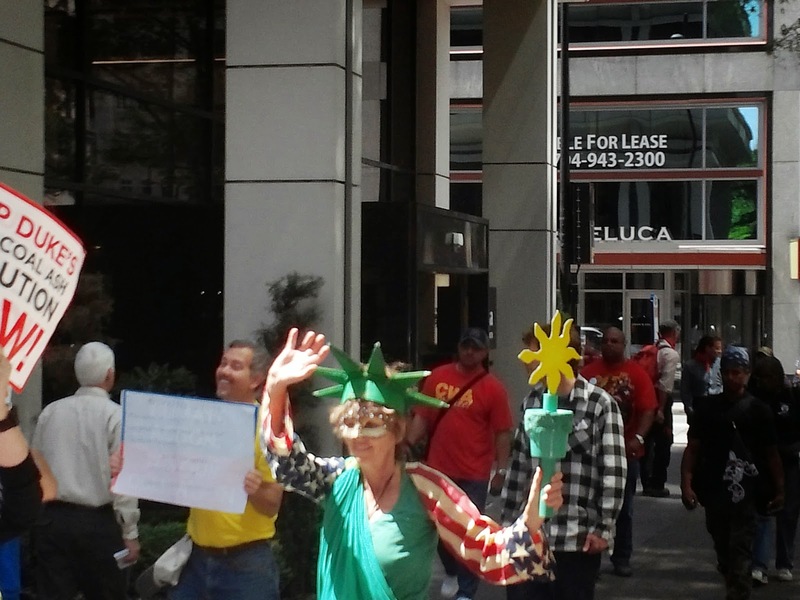 Are our public offices simply for sale? It has been two weeks since primary election night, and in that time I've seen multiple emails and web comments from conservative activists throwing in the towel on the Republican party. Numerous party registrations are supposedly being changed. While I'm not there - yet, there is this unsettled feeling I can't shake. That feeling is summed by the following question. Are our public offices, simply for sale to the highest bidder? Or, more specifically is money the most important thing in our elections - trumping positions and support from the grass roots? "In North Carolina, what everyone always forgets is that grass roots will not carry you over the finish line," said Shaheen. "It will help you get to the starting line and push you over it." The main difference in US Senate primary according to the Washington Post article was simply the money the Tillis Campaign raised. That sentiment is backed up by this article in National Journal showing that Thom Tillis was in a tight contest with Greg Brannon and Mark Harris in January. By April after an avalanche of outside money poured in from Karl Rove and Mitch McConnell, he had a big lead. "The goal was simple: Increase Tillis's low name identification, knowing his opponents wouldn't have the resources to fight back. In January, the group commissioned a survey from veteran GOP pollster Jan van Lohuizen showing Tillis only tallying 16 percent in the crowded field, with 60 percent of Republican voters unsure of their choice. Just over one-quarter of North Carolina GOP voters were familiar with Tillis. But in the middle of their advertising blitz in late April, another poll commissioned by Crossroads and conducted by van Lohuizen found Tillis's name identification had shot up to 66 percent, with him tallying 38 percent of the primary vote. That same poll showed only about one-third of voters familiar with Brannon and Harris." Think about that for a minute. Thom Tillis, one of the top 3 politicians in the state, has name ID at only 25% among his own party a few short months before the election. That's a sad enough statement on the state our electorate. Then the adds pour in and he wins simply because people know who he is and don't know the other candidates. In that scenario issues don't even really matter. That's the truly pathetic part. And there are other examples of the overwhelming influence of big money on our local races. In the 2012 cycle, the Republican primary election for the ninth Congressional District (NC-9) saw a similar influence of big money. Robert Pittenger spent more personal money that just about anybody in the country in that election - dumping about $2 million into the congressional primary against his nearest contender - former Mecklenburg County Sheriff Jim Pendergraph. Robert Pittenger actually received a fine for one of his personal donations to his campaign when a donation made right before the first primary was not reported correctly. See this story from Roll Call for the complete details. A freshman Congressman has paid a $31,000 fine for a campaign finance disclosure violation in his first federal election. But the fine was a relatively small amount for the 13th richest member of Congress. The campaign committee of Rep. Robert Pittenger, R-N.C., failed to file a 48-hour contribution notice prior to his May 8th primary election in 2012. The pre-election notice would have disclosed Pittenger’s own $309,000 contribution to his campaign on April 26, 2012. Pittenger failed to win the primary outright, but ranked first with 32% of the vote in the eleven-candidate field. In the July 12th primary run-off, Pittenger beat former Mecklenburg County sheriff James Pendergraph. The Federal Election Commission required the Pittenger for Congress LLC to pay a $31,010 civil penalty, which included $110 for one notice not filed, plus 10% of the overall contributions not filed. The fine was paid on February 21, 2013. In that same primary, Jim Pendergraph only committed $21,322 of personal money to his campaign. Robert Pittenger paid a fine on just a small portion of the funds he committed to the race and that fine was 150% of the entire amount of money his opponent was able to commit. Personal money also played a major role in the recent campaign to replace Thom Tillis in the Legislature. John Bradford has already loaned his campaign $160,000 for this election cycle and spent a whopping $100,000 battling it out to a big win for the Republican nomination for NC-98. According to campaign finance reports, he appears to be the only candidate in the primary who paid for TV time, and his campaign signs were ubiquitous. In both of these campaigns it appears personal money was a driving force in the victory whether the race turned out to be a close one or a landslide. In both cases the candidates were running in safe Republican districts so all of this money was spent against other Republicans in primaries. Incidentally, Larry Shaheen is on the Bradford Campaign payroll according to campaign finance reports, so it appears the campaign has taken Mr Shaheen's comments about money trumping grassroots to heart. I'm not naïve enough to think money isn't important in political campaigns. It obviously is. However, these recent campaigns all signal that it's the most important thing. As an activist who likes to think hard work matters and influencing voters through personal connections can make a difference, that's a hard pill to swallow. Tuesday evening, Davidson had the required town budget hearing for the upcoming 2014-2015 budget that's due by the end of June. Below is the twitter feed and video of that portion of the Board meeting. 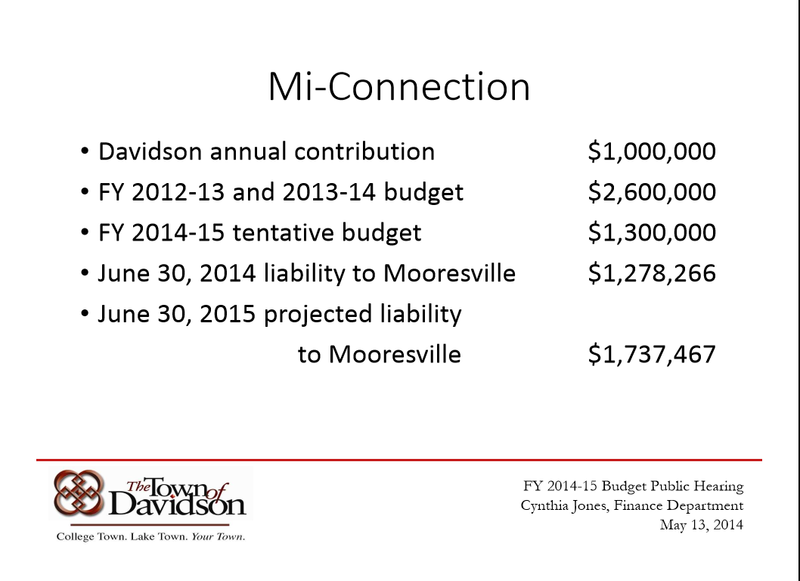 6:05 PM - @TownOfDavidson May monthly Board mtg underway at #Davidson Town Hall 2014-2015 budget hearing on agenda. 6:36 PM - @TownOfDavidson #Davidson Commissioner Jim Fuller makes point that our tax rate is second lowest compared to benchmark towns. 6:40 PM - @TownOfDavidson #Davidson...bit of a flare up over how the town did the Citizen Survey and ensures inclusion for the West Side neighborhood. 6:47 PM - @TownOfDavidson to try to get more info to #Davidson West Side residents. Commissioner Cashion steps up to see how she can help do that. If you have ever worked in an environment where conference calls are commonplace, then you've probably experienced someone being "burned by the mute button." That's where someone says something unfortunate when they think they are on mute, but it turns out they are not. A version of that embarrassing scenario unfolded this past weekend for NC House Republican Leader, Paul "Skip" Stam, when an email extolling the virtues of tolling NC's roads inadvertently was sent out to those beyond an inner circle including senior staff in Speaker/US Senate Candidate Thom Tillis's office as well as staff from the NCDOT. Check out TheDailyHaymaker.com for the full text of the talking points we're all sure to hear as NCDOT wraps up its contract on NC's first (but surely not the last) HOT lanes contract. As tolling becomes the preferred method for increasing road capacity on major arteries in NC, don't forget who brought them to us - NC's Republicans. More specifically, they were brought to you by your NC Republican Leadership. Davidson fees set to rise as part of new budget? At the April 22nd Davidson Town Board work session, there was a lengthy discussion on the town budget. As part of the ongoing conversation, commissioners pondered hefty increases to Davidson's already highest in the area fees. If passed, these fee increases would bring Davidson's solid waste charges to an even $250/year. Davidson's Board is contemplating raising the town's solid waste fee $17/household to add weekly pickup of recycling. That's up from the bi-weekly service we have now. Mayor Woods cited receiving a few emails from residents requesting it, but other than that there appears to be no real justification for the increase. It's a classic example of an idea that feels good on paper, but in reality will do little to nothing for the average Davidson household. Moreover, the facts available to the town at this point simply do not support the need for this change. As you may remember, a couple of years ago the town switched from the small 18-gallon recycling bins with weekly pickup to the large 96-gallon rolling bins with pickup every other week. This change took place October 1st in 2012. The town also installed $22,000 worth of trash and recycling duobins on Main Street in late 2012. Combined one might expect the overall % of solid waste that is recycled to increase. Somewhat surprisingly, that was not the case in the year these changes took place. The below graph is the year over year recycling percentages of solid waste provided by town Public Works Manger, Doug Wright. The fiscal year runs from July 1st to June 30th. The 96-gallon bins were in place for 3/4 of the 2013 fiscal year and the duobins for about 1/2. 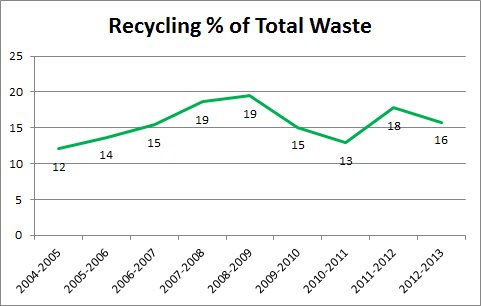 However, as you can see the percentage of waste recycled in 2013 actually dropped year over year. Also, as anecdotal evidence that increased recycling pickup is not needed for the vast majority of Davidson households, one only has to look at the bins next time it's pickup day. The red bins rarely have the tops lifted at all. The vast majority of bins are not overflowing - not even close. The Town should wait on any fee increase for expanded recycling pickup until the data shows a clear need by solidly increasing recycling percentages. Currently, that's not the case, but new data should come out before the new budget is passed in June. This should be a purely data driven decision, not a decision driven by a few emails. The other solid waste fee increase being discussed has to do with leaf pickup. Back before the days of Mi-Connection and its drain on town coffers, the town picked up leaves in the fall funded out of residents' property taxes. That ended in 2010 - the same fiscal year the Mi-C subsidies exploded. Now, the town is discussing implementing a $32/household increase to the solid waste fee to reinstitute that service. While people may like the idea of the leaf service and for many long-time residents it is definitely missed, a solid waste fee is the wrong mechanism for funding this. Unlike household waste where there is not a huge difference in the amount of trash or recycling generated by a large house versus a small house, leaves are a different matter. Common sense says large houses with large lots and more mature trees generate more leaves. Small houses or houses with few mature trees generate fewer leaves. The use/need for a leaf service is not evenly distributed, but implementing a household fee distributes the cost evenly. It is a regressive tax and something that should be avoided. If the town wants to proceed with purchasing new equipment to support this service, it should be included in an updated CIP and paid for out of property taxes, not fees. For both of these fees, it was mentioned that the Homestead Exemption for qualified elderly and low income residents exempts homeowners from paying. In theory, that would reduce the regressive nature of these fee increases. The same applies to owners of homes in Davidson's Affordable Housing program - they are also exempt. However, that has a minimal impact overall. According to the town, as of 2012, there were only 26 households in Davidson that had the Homestead Exemption. Combined with the Affordable Housing numbers that makes totals only about 100 or so households that would be exempted from these fee increases. That's out of about 3400 households in town. For a town that supposedly prides itself on doing things to improve affordability, increasing unnecessary and regressive fees is not something commissioners should be doing. The public hearing for this years budget is this coming Tuesday, May 13th at the Board's 6pm regular meeting. Update: Good news! The latest published proposed fee schedule shows no increase for single family homes. There is in fact a good decrease for multi-family homes. Good news all around! 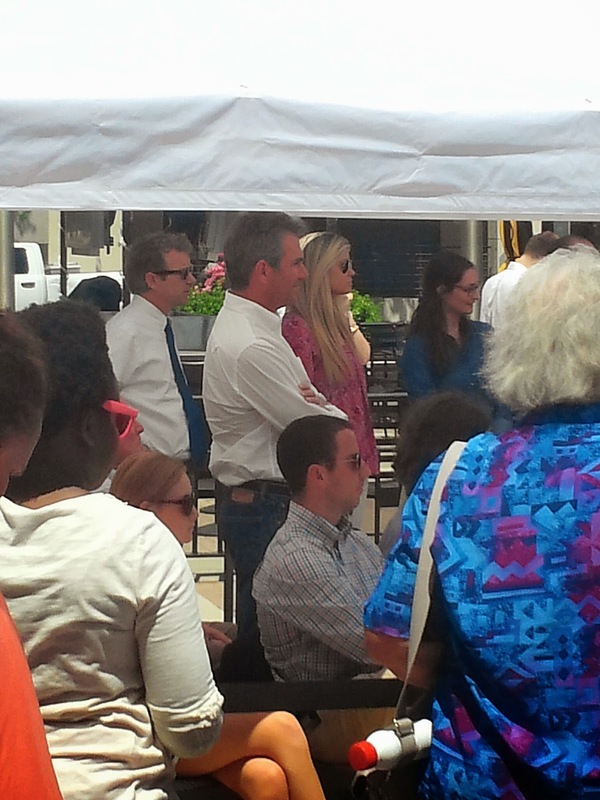 Dr Greg Brannon had a campaign event in Uptown Charlotte today outside the NASCAR HoF. About 200 people were in hand to hear Dr Brannon and special guest Kentucky Sen Rand Paul at a lunchtime rally the day before election day. As you can imagine there was plenty of conservative red meat in the various speeches. 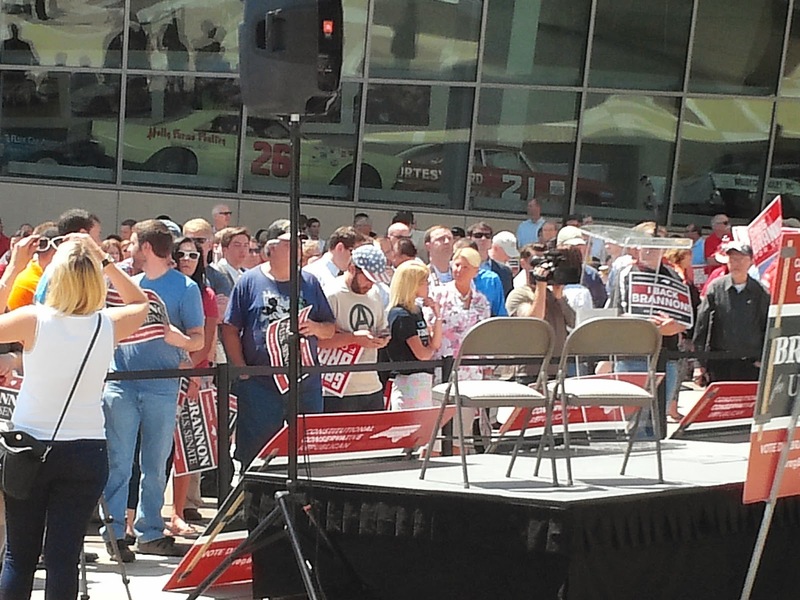 However, what caught my attention above and beyond the standard campaign rhetoric was how young the crowd was that came out today. Without a doubt it was the youngest crowd I've ever seen at any Republican candidate campaign event in this area. That's not to say you won't see any people under 30 at the other candidates' events. 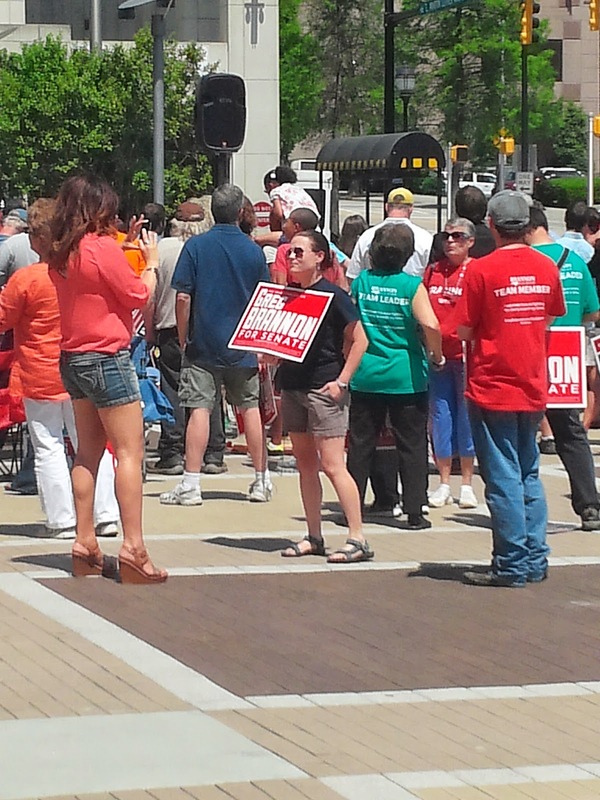 It's also not a knock on the more mainstream Republican events where the crowd is more seasoned. However, it is a real and tangible statement that the message of the liberty movement epitomized by people like Sen. Paul and Dr. Brannon resonates strongly with the younger generation. The word 'fighter' was used frequently by the different speakers. Regardless of how tomorrow turns out, the Republican party should take heed of the fact that a true fighter is what the next generation of Republican activists wants in its candidates. So, I am getting a hot dog for lunch at the Chili Man in Uptown today - waiting on one of the best hot dogs you'll ever taste while enjoying Vic the Chile Man's running stand up routine - when what do I see coming my way? A protest, a good old fashioned protest complete with banners, chants and marching down the sidewalk. These good folks were there apparently to express their discontent with Duke Power over the infamous Dan River coal ash spill. 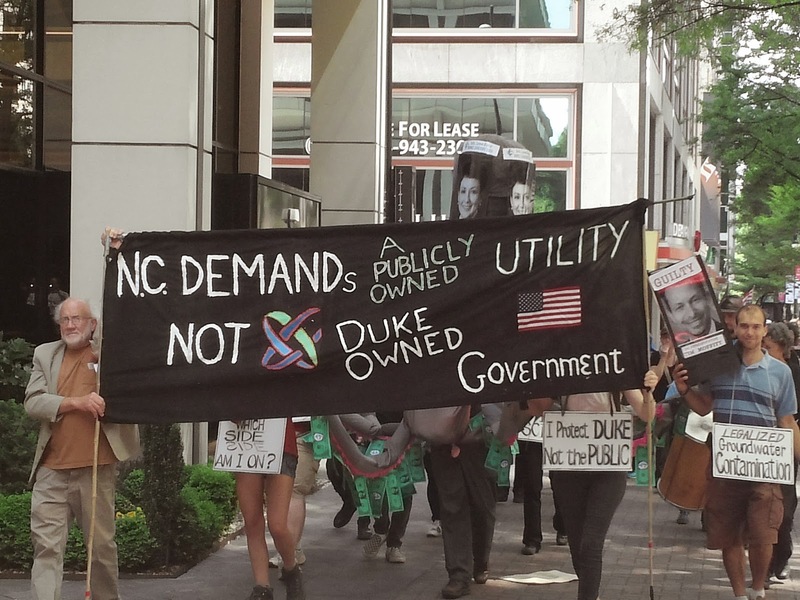 You see, Duke was having its shareholder meeting today and these people just wanted to exercise their rights as Americans to protest. 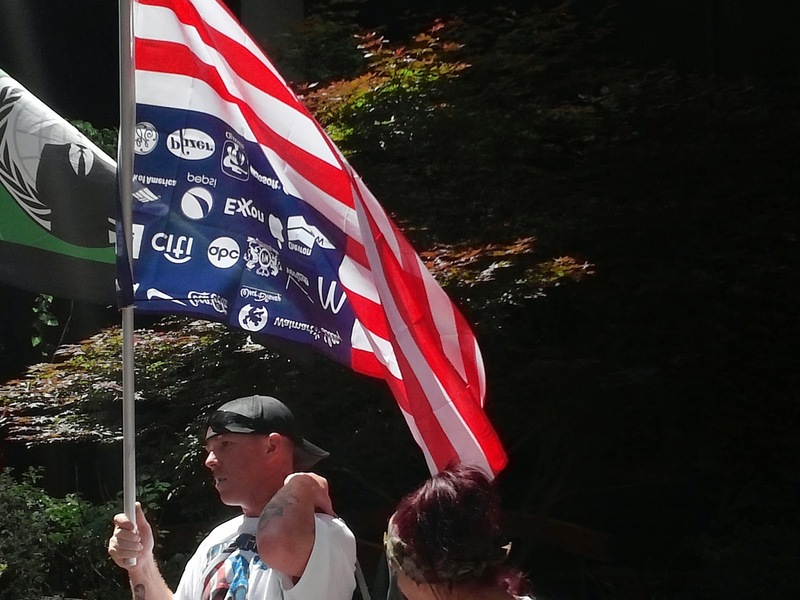 They may have worn some silly costumes, made inappropriate use of the American Flag, and suffered challenges with letter spacing on their main banner (notice the small S at the end of "DEMANDs"), but hey, they were just there to have a good time and give Duke some well deserved grief. The totally overzealous activation of Charlotte's "extraordinary event" ordinance, that's what. 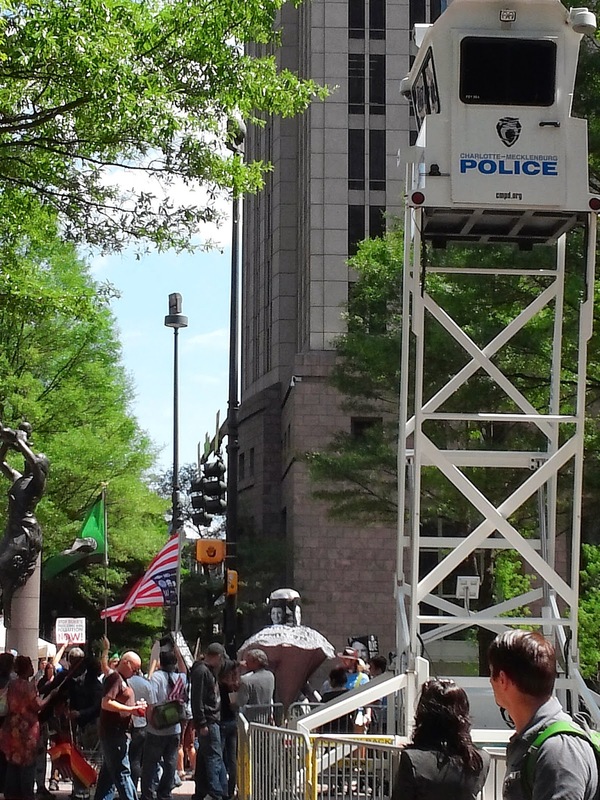 Charlotte busted out its draconian security measures implemented for the DNC in 2012 for a protest that had maybe 30 people by the time the marchers had reached the Square at Trade and Tryon. This ordinance allows for greatly expanded search authority for just about any reason. 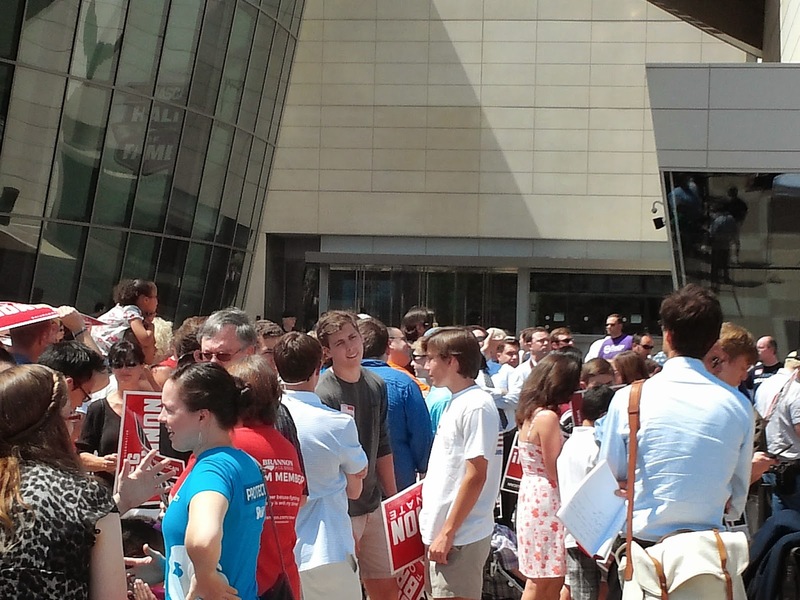 For a protest like this, implementing the policy seemed more designed to intimidate than protect. "It was just a precaution," you might be saying. Or, "nobody was accosted by the officers, so it doesn't really matter". While true, those thoughts miss a larger point. 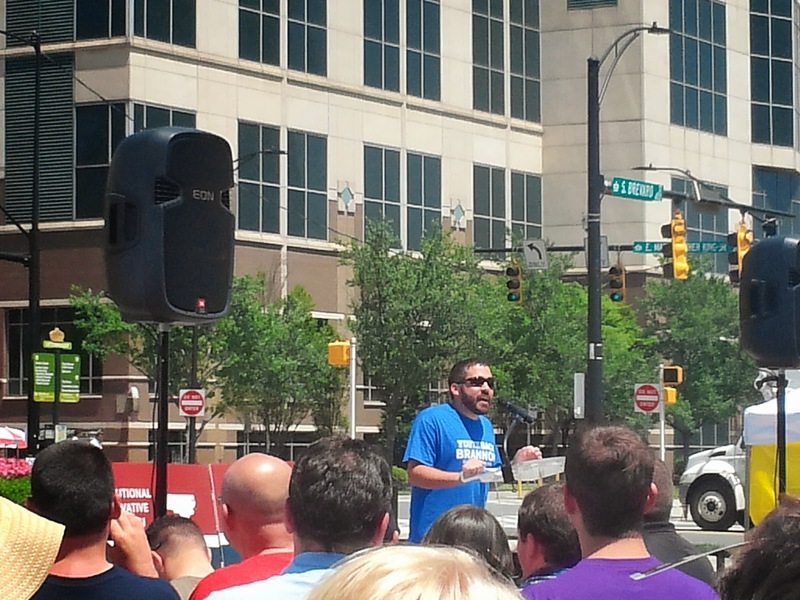 For the DNC, every town in the area passed an ordinance like the one Charlotte has. It's an ordinance designed to handle truly large events that truly might get out of control. Not something like was seen today. The authority to implement these powers rests with the unelected city or town managers in the municipalities. That's a lot of authority to hand over to someone not accountable to the voters. After seeing its misuse today, our local governing boards should reconsider the criteria for activating such ordinances to ensure they are truly for "extraordinary events". Along those lines, wielding such authority should require elected officials to go on record with an explicit approval﻿ whenever possible.